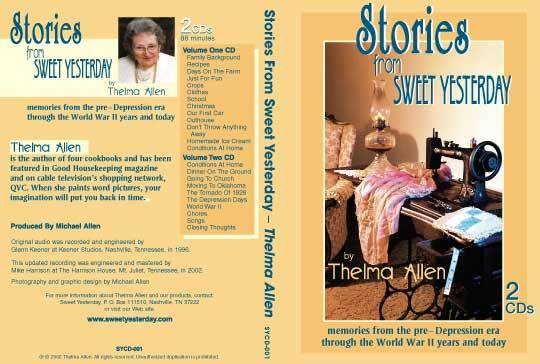 "Stories From Sweet Yesterday" two audio compact disc package. Michael Allen created this product with his 92 year old mother, Thelma Allen. She tells her stories from the pre-Depression days through World War II on two CDs. It was Michael's idea to put his mother's stories on CDs. He also produced the recording sessions and did the photography and graphic design. The product is marketed on this Web site.